Ultimate Radiant Barrier & Insulation provides installation of the very best solar attic fans in the industry. Top 5 Reasons to Install Our Solar Attic Fans! Reduces the load on your HVAC system. The closer your attic temperature is to the outside ambient temperature the easier it is for your air conditioner to cool your home. By lowering your attic temperature you will save on your cooling bills. Also, when your HVAC unit is in a cooler environment you will take the stress off of the unit resulting in less mechanical breakdowns and saving you money and aggravation. Increases The Life of Your Roof! Attic temperatures can reach a sweltering 170 degrees on hot summer days. By installing our solar attic fan you can reduce these temperatures by up to 50 degrees. In fact, shingle manufacturer warranties require proper attic ventilation. When your shingles are overheated the granules on the shingles loosen and are washed away.This leaves the shingles exposed to the sun, which significantly reduces the life expectancy of your roof. Takes The Heat Load Off of Your Insulation! A hot attic will actually fill your insulation with heat causing excessive heat transfer from your attic to your living space. By reducing this heat you will improve the efficiency and comfort of your home. Reduces Moisture Levels in Your Home! Your home’s HVAC is designed to pull moisture from the air. As air from your air return crosses the cold A/C coil it extracts moisture. The air is then transferred through the duct system in your attic. This is where you will build moisture because of the temperature differential between the cool air in the ducts and the excessively hot attic. By lowering attic temperatures you will lower the humidity level in your duct work and your home, greatly increasing your homes comfort. Reduces Moisture Levels In The Attic All Year Long! Attic moisture levels increase in several ways. In everyday living, you are taking showers and cooking which raise the humidity level in your home. Also as hot and cold fronts move through, we have temperature swings from hot to cold. This will cause condensation in your attic. Our solar fan is unique because not only does it come with a temperature sensor it also has a humidity sensor that turns the fan on when humidity levels reach 75%. High moisture levels in your home can be detrimental to your insulation and can allow mold to grow. The purpose of proper ventilation is to reduce temperatures inside the attic and other enclosed spaces throughout the year. In the summer this helps make the living areas more comfortable and reduces A/C usage which also saves energy. This helps reduce heat which can cause deterioration of singles, roof boards, sheathing, siding, insulation, and valuables stored in the attic. Not to mention, this can also shorten the lifespan of an HVAC system. In the winter, proper ventilation helps to prevent moist air from condensing on the underside of the roof, beams, and rafters. Condensation can cause mildew, rotting of wood and excessive rusting of some components of the roof structure. Our solar attic fan is a great solution to combat all of these conditions. No other product offers these features, performance, and style at such a great value. While passive ventilation works fine in areas with moderate climate, it cannot disperse heat effectively enough when your roof’s surface temperature reaches over 180 degrees. With nowhere to go, the heat trapped in your attic will find its way into your living space, causing a spike in the indoor ambient temperature. The increase in the temperature will then cause your air conditioning system to consume more energy as it tries to keep temperature low, subsequently causing it to consume more energy. 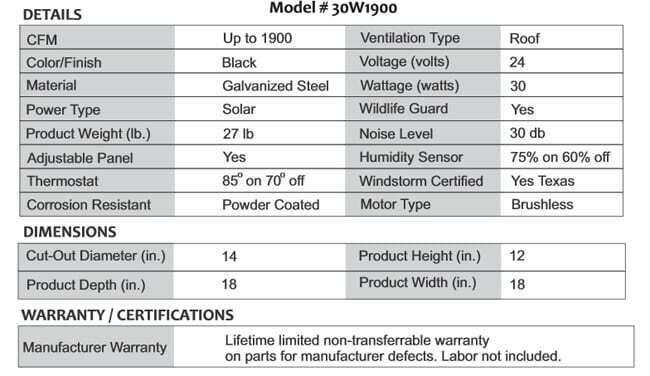 Corrosion resistant construction – All solar attic fans are built to last. Stainless steel hardware and brackets ensure that your fan will never be prone to corrosion and water damage. High efficiency impact resistant solar panels – Unlike most brands, our fans only use high-performance monocrystalline solar panels – one of the toughest silicon materials known to man. No need to worry about breakage. Push your savings even further. 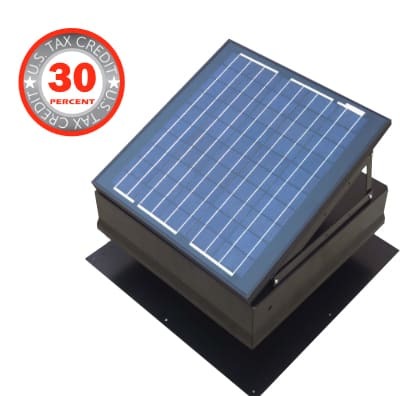 Solar attic fans by Ultimate Radiant Barrier & Insulation have been proven to save energy that installing it on your home makes you eligible for a 30% Residential Renewable Tax Credit. If you use it on your business, you likewise qualify for a 30% Business Energy Investment Tax Credit. Your solar fan would have paid for itself in terms of energy savings in a matter of years. With Ultimate Radiant Barrier & Insulation, you are assured of high-performance products and professional services at top value you can’t find anywhere else. 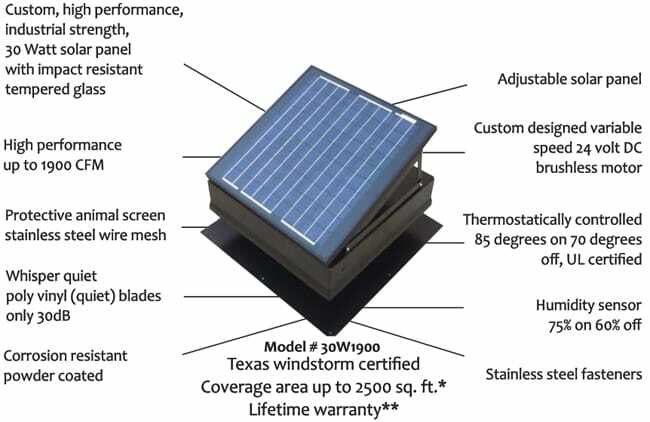 Call us today and find out how you can get your solar attic fan.